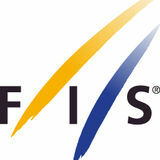 Foreword - from FIS President The 2nd edition of World Snow Day took place in spectacular fashion on 20th January 2013. 435 Organisers in 39 countries staged unique events that brought children and their families together to celebrate all things snow in a friendly and fun environment. Thanks to the commitment of these Organisers, many youngsters around the world had the opportunity to explore, enjoy and experience snow sports. From the beginning, the goal of the World Snow Day campaign has been to increase access to snow sports and this yearâ&#x20AC;&#x2122;s event showed great promise towards this aim. Major activities took place in five large cities around the world complemented by over 100 ski resorts offering free lift passes for children. All being well the success of these actions will encourage even more Organisers to follow this example and facilitate access to snow sports. The dedication and creativity of the local Organisers has been outstanding and sincere congratulations go to all of them for their contributions. Our thanks are also extended to the children and their families who participated in the events all around the world. Hopefully they not only had an exciting day and enjoyed a positive experience to remember for years to come. Moreover, FIS would like to thank the World Snow Day partners: the European Broadcasting Union, Eurosport, Infront Sports & Media, Milka, Intersport, Best of the Alps and Sanetta for their great cooperation and support. The success of the 2nd edition of World Snow Day instills in us great confidence for the future, in particular the support from all the snow industry stakeholders who have contributed to providing the international snow community with a great platform for bringing children to the snow. We look forward to having an even greater number of children and their families participate in the 3rd edition of World Snow Day on 19th January 2014, to explore, enjoy and experience snow. Acknowledgements The FIS World Snow Day 2013 Final Report would not have been possible without the support of the Local Event Organisers and the contributions of hundreds of individual participants whose feedback has been invaluable. Thanks are also due to the FIS Member National Ski Associations that helped promote the concept in their respective countries and all local and international partners and sponsors for their continued support. Who is the International Ski Federation (FIS) ? What is Bring Children to the Snow ? What is World Snow Day ? The 2nd edition of World Snow Day took place on 20th January 2013 and saw more than 430000 participants exploring, enjoying and experiencing snow at 435 events held in 39 countries around the world. Children and families enjoyed free or discounted ski and snowboard lessons, lift passes, ski equipment, as well as concerts, fun races, gifts and prizes, among many other things. Events took place in cities, on high mountain peaks, and everywhere in between and ranged from small to enormous. The Local Event Organisers included ski and snowboard resorts, National Ski Associations, private event companies, ski and snowboard clubs, ski and snowboard schools, manufacturers and retailers. The majority of World Snow Day Organisers and participants have expressed a strong interest in participating in the 3rd edition of World Snow Day which will take place on 19th January 2014.
Who is the International Ski Federation (FIS) ? As the governing body of international skiing and snowboarding, FIS manages the Olympic disciplines of Alpine Skiing, Cross-Country Skiing, Ski Jumping, Nordic Combined, Freestyle Skiing and Snowboarding, including setting the international competition rules. Through its 115 member nations, more than 6’500 FIS ski and snowboard competitions are staged annually. Specific initiatives are undertaken by FIS to promote snow activities as a healthy leisure recreation, notably for the young. .
What is Bring Children to the Snow ? The ‘Bring Children to the Snow’ campaign was launched in 2007 as an international, multi-year campaign to promote snow activities as the number one leisure choice for kids and the youth in winter. The campaign aims to encourage newcomers to the snow whilst adding additional value to those who already participate in the sport. The campaign seeks to achieve this vision through two primary programmes, the FIS SnowKidz and FIS World Snow Day. The primary target group for the campaign is children between the ages of 4-14 and their families. Whilst targeting children and their families, FIS also hopes to motivate more teenagers and young adults. The campaign is not focused on generating competitors for any particular FIS discipline. ‘Fun in the snow, fun on the snow’ is the motto at the heart of the campaign. What is World Snow Day ?  World Snow Day was launched in 2012 and looks beyond the FIS membership who are the backbone of the FIS SnowKidz programme to the wider snow sports community. It seeks to encourage the snow industry stakeholders to be part of activities for children aged from 4-14 to celebrate all things snow. In short, World Snow Day is designed to be the biggest day on snow all year and will be staged annually for years to come. 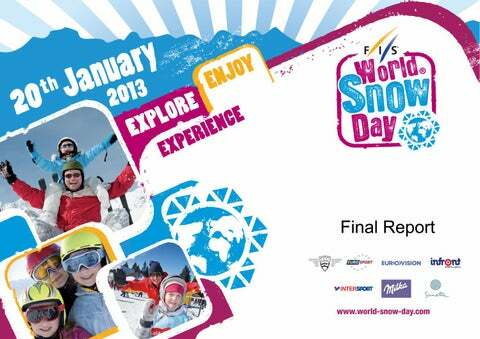 This report summarises the key facts and figures from the 2nd edition of World Snow Day which took place on 20th January 2013. Enable children and their families to Explore, Enjoy and Experience the fascination of snow through special events and activities organised as part of World Snow Day. Create global momentum for a great future for all involved in snow activities: Reach 500,000 individual World Snow Day participants by the third edition. Increase awareness about the need to protect and conserve the natural environment. Promote the health benefits of snow sports to all participants. Emphasise the importance of snow safety and awareness of the FIS Skier and Snowboarder Rules of Conduct. 1 Day around the world. 2 Events in the Southern Hemisphere. 7 Global Partners: Eurosport, European Broadcasting Union, Infront, Intersport, Milka, Sanetta and Best of the Alps. 9 Events designed to benefit disadvantaged youth and children. More than 100 resorts with free skiing and snowboarding. 189 events in one country. 660 World Snow Day events over two editions. Estimated 10,200 minutes watched on YouTube. More than 29,800 YouTube Video Views. 52,920 people reached with a single Facebook post. More than 120,000 participants at the largest event. More than 194,000 Website visits since November 2012. More than 430,000 participants in the 2nd Edition of World Snow Day! World Snow Day by Continent and Country The 2nd Edition of World Snow Day saw 435 events organised in 39 countries across 5 continents. Types of Organisers World Snow Day Events were staged by a wide variety of Organisers. The most common were Ski Resorts (151 events representing 35%) and Ski and Snowboard Clubs (107 events representing 25%). This is an 8% increase for Ski Resorts and a 13% increase for Ski and Snowboard Clubs. Interestingly Tourism Organisations increased by 4% in comparison to last year. (09.07.2012) Partnership with Milka for 2nd Edition of World Snow Day confirmed . (22.01.2012) Completion of 1st edition of World Snow Day 225 Organisers 39 countries. (01.07.2012) Opened event registration on WSD website â&#x20AC;&#x201C; 1st registered event Childrenâ&#x20AC;&#x2122;s Ski Festival, Yekaterinburg (RUS). (22.08.2012) Partnership with Best of the Alps for 2nd Edition of World Snow Day confirmed. (19.09.2012) 50th World Snow Day event registered, 2 months ahead of previous year. (16.10.2012) 100th World Snow Day event registered, 3 months ahead of previous year. 100 Days to go until World Snow Day. (20.01.2013) 2nd Edition of World Snow Day celebrated by 439 Organisers in 39 countries and over 430,000 participants ! (15.12.2012) Registration closes. (12.12.2012) World Snow Day Promotional Trailer launched. (01.12.2012) 226th World Snow Day event registered, meaning the 2nd Edition of World Snow Day would be larger than 1st Edition. 3rd Edition of World Snow Day announced to take place on 19th January 2014. (15.01.2013) Partnership with Eurosport for 2nd Edition of World Snow Day announced. (22.12.2012) Partnership with Intersport for 2nd Edition of World Snow Day confirmed. (13.12.2012) 300th World Snow Day event registered and 39 Countries confirmed for 2nd Edition of World Snow Day. (19.12.2012) Partnership with the European Broadcasting Union for 2nd Edition of World Snow Day announced. (01.01.2013) World Snow Day Promotional Trailer launched globally in five languages. Virtual World Snow Day launched on all FIS websites. (16.01.2012) 7th Partner joins World Snow Day team, Sanetta offering childrenâ&#x20AC;&#x2122;s clothing. (21.01.2013) Reporting system for World Snow Day launched. Websites www.world-snow-day.com is the official website for World Snow Day. In addition to releasing all related news and useful information, the website provides each registered Organiser with a dedicated page to promote their event and associated partners. To help develop the World Snow Day identity registered Organisers have access to a free online toolkit with banners, flags, souvenirs, diplomas and other promotional items. The WSD official website is cross-linked and promoted by all official FIS websites, pages and communication platforms. From 1st January 2013 â&#x20AC;&#x201C; 20th January 2013, the Virtual World Snow Day campaign drew global attention and included the World Snow Day promotional trailer along with various links and promotional activities across all FIS and numerous Organiser and official partner websites. Presence at FIS World Cup Events From 1st January â&#x20AC;&#x201C; 20th January 2013, the World Snow Day brand was featured on the starting bibs of all competitors in FIS World Cup events. The World Snow Day Promotional Trailer was incorporated into all FIS World Cup broadcasts thanks to the support of the European Broadcasting Union and Infront Sports and Media. The Promotional Trailer was also shown on site at numerous World Cup events and was complemented by the distribution of World Snow Day promotional material onsite. World Snow Day on TV From 1st January 2013, the second official World Snow Day promotional TV spot was made available in six languages (English, French, German, Italian, Spanish and Russian) to all registered World Snow Day Organisers and the FIS World Cup Organising Committees. The TV spot was made available to all EBU members and was broadcast on Eurosport throughout the month of January 2013. The online versions were made available on the World Snow Day YouTube channel and were promoted via numerous social media channels and websites. Media Campaigns FIS continuously published news through its global communication platforms which include the www.fis-ski.com website and associated social media channels along with various newsletters. All official World Snow Day press releases are available on the World Snow Day website via the following link http://world-snow-day.com/en/Info/Media. The press releases were distributed to the extended FIS Family and all affiliated media and partners. Furthermore, World Snow Day news is now featured in the regular â&#x20AC;&#x2DC;Bring Children to the Snowâ&#x20AC;&#x2122; section of the FIS Newsflash sent out to over 10,000 recipients weekly. FIS Youth and Childrens Seminar The 10th FIS Youth and Children’s Seminar was held in Zurich, Switzerland, on the 3rd October 2012. The title of the seminar was ‘Benchmarking: Learning across sports boarders.’ For the first time, other international and national sports federations were invited to present their programmes and efforts to bring children to their sports. The Seminar also reflected on the 1st Winter Youth Olympic Games in Innsbruck in January 2012, and explored experiences of athletes and National Ski Associations before, during and after the Games. The Youth and Children’s Seminars have grown substantially during their 10 years of existence, with the 10th edition boasting the participation of more than 80 delegates from over 40 National Ski Associations. Partner Actions The 2nd Edition of World Snow Day was supported by seven exceptional partners: Eurosport, European Broadcasting Union, Infront Sports & Media, Intersport, Milka, Sanetta and Best of the Alps. The potential of World Snow Day has been substantially enhanced by these partners’ excellent participation and cooperation. European Braodcasting Union (EBU) The European Broadcasting Union is the largest association of national broadcasters in the world. The EBU made the World Snow Day Promotional Trailer available on their global distribution channels for broadcasters around the world to download and place on their networks. From 20th January to 15th February 2013, World Snow Day Organisers submitted event reports in the form of text, photos and videos through the World Snow Day Live Profile system. The individual 2013 World Snow Day event reports can be viewed here http:// world-snow-day.com/en/WSD/Final_Reports/2013 . During this period, an online survey was conducted to collect feedback anonymously from the public who attended a World Snow Day event and also those who could not. Feedback from Event Organisers Based on the information collected from the World Snow Day Organisers, the most popular promotion offered to participants was free ski and snowboard passes (over 65%). More than 30% of the Organisers provided free gifts and prizes, and over 25% offered free ski and snowboard lessons. Do you feel the World Snow Day brand helped you attract participants? 47.8% of World Snow Day Organisers said that the World Snow Day brand helped them attract participants to their events. This represents an increase of 3.3% on the previous year. Do you feel the World Snow Day brand helped attract media attention? 41.8% of World Snow Day Organisers said the World Snow Day brand was very helpful in attracting local media attention. Do you feel the World Snow Day brand helped motivate your team? 52.2% of World Snow Day Organisers stated that the World Snow Day brand helped motivate their team to create the event. Comparisons with last year show this to be a 2.8% increase on ‘Very Helpful’ and a 0.6% decrease on ‘No Influence’. Do you plan to organise an event for the next edition of World Snow Day (19th January 2014)? 58.7% of World Snow Day Organisers stated they will participate in the 3rd edition of World Snow Day. Moreover, an additional 23.9% of World Snow Day Organisers stated that there is a good chance they will participate in next edition of World Snow Day. Feedback from World Snow Day Participants How much did you enjoy your World Snow Day event? From the information obtained, 74% of people who were able to attend a World Snow Day event thoroughly enjoyed themselves. This is a positive increase of 12.4% on the previous year. How did you hear about World Snow Day? 62.5 % of those surveyed said that they were informed about World Snow Day through their Local Organisers. What interests you about World Snow Day? Activities on snow and gathering with family and friends were the top attractions of World Snow Day events. Which special offers attracted people to the snow? The majority of participants were most interested in free or discounted lift passes, followed closely by ski and snowboard lessons. Equipment, clothing, food, beverages, gifts and prizes were also important attractions for participants. These statistics show that it is a combination of services from different stakeholders which come together to attract people to the snow. Do you plan to participate in the next edition of World Snow Day (19th January 2014)? Over 80% of participants in World Snow Day events plan to participate in the 3rd edition of World Snow Day (19th January 2014) underscoring that World Snow Day events were fun and successful. Feedback from Non-Participants Why could you not participate in the 2nd Edition of World Snow Day? Feedback from non-participants revealed that the majority of children and families who could not attend a World Snow Day event had other pre-existing obligations which prevented them from participating. Moreover, 36.3% of non-participants indicated that they feel snow activities are too far away from their homes. This signifies the importance of making transport options available for events where possible, trying to organise more events in the metropolitan areas and informing participants about World Snow Day events early in the season to ensure they make time to attend. Which activities or promotions would help you to participate in snow sports more? Non-participants indicated overwhelmingly that free or discounted lift tickets would be the best promotion which would allow them to participate snow sports. They also indicated that participation would increase if free or discounted food, beverages, accommodation and lessons are offered. Do you think you might participate in the next edition of World Snow Day (19th January 2013)? According to the surveys conducted with the public, it was a positive sign to see that of the persons who did not participate in the 2nd edition of World Snow Day, 56.7% of those surveyed aim to participate in the 3rd edition of World Snow Day. Based on the information and feedback received, FIS has compiled a short list of suggestions 2014 World Snow Day Organisers. Get your event signed up early The earlier you register your event with thorough information and images, the more exposure you will enjoy. Early registration will also increase the possibility of solid media attention and developing partnership opportunities and may reduce organisational costs because of early venue, accommodation and transportation reservations, etc. In addition, statistics show that local Organisers were the main source of information for potential participants, so a longer lead time enables more promotion over time which should be helpful for increasing the number of participants. Furthermore meeting deadlines of event registration and report submission will enable FIS showcase your event to partners looking to partner with Organisers Through the global platform, it will also be possible to showcase the many different ways there are to enjoy the snow all over the world. Make full use of global promotional tools The World Snow Day website is a free platform to promote registered events. The average daily visits in January 2012 reached 4,072 with the peak of 10,023. For the 2nd edition of World Snow, the average daily visits in January increased to 4,999 with a peak of 11,133 on 20th January. For World Snow Day 2014, the website will be upgraded to be even more user-friendly and interactive. Organisers are strongly suggested to take advantage of the live profile system as a sub-website to promote their events and partners. Decorate the atmosphere with World Snow Day branding Given the increasing global awareness of World Snow Day, it helps to leverage the identity for your event. Good examples from World Snow Day 2013 included creative use of banners, flags, race bibs, face tattoos, skis, hats, shirts, mascots, and so forth. Many designs and templates for the items listed can be accessed through the online World Snow Day Toolkit. All these items are free of charge to use once registered. Have a Plan B Bad weather or transport conditions resulted in the cancellation of several events in 2013 and it makes sense to create a contingency plan in case of inclement weather, which can happen at outdoor events. Some suggestions may include indoor activities or activities at the base of the mountain. Having a Plan B can eliminate the disappointment of a cancelled event. The 2nd World Snow Day was bigger and better than the inaugural edition in 2012. The 1st World Snow Day on 22nd January 2012 attracted more than 200,000 participants and the 2nd edition already succeeded in providing more than 430,000 children and their families with the opportunity to explore, enjoy and experience snow. FIS is confident that the goal of 500,000 participants by the 3rd year is achievable and will continue to work with the Organisers to stage high quality, fun and enjoyable events. FIS looks forward to developing World Snow Day together with many different stakeholders and hopes you can continue to be a part of this great initiative. Your feedback and suggestions are welcome at any time. See you for the 3rd World Snow Day on 19th January 2014!